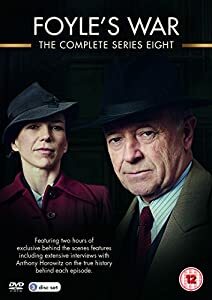 The final episode of Foyle's War - the much loved British detective drama - was broadcast on 18th January 2015 after 9 series and 28 episodes. Set during WWII, as the battle rages across the Channel, police detective Christopher Foyle (Michael Kitchen) reluctantly remains on duty in his quiet English coastal town. The battle then comes to Foyle in its own way as he probes war-related cases of murder, espionage, and treason. Mystery blends with history, moral complexity, and period atmosphere. In Season 7, we saw Foyle take on a new role at the British Secret Intelligence and in Season 8 the series was reinvented as a Cold-War thriller. "The fact that we have managed to continue so long I put down to the really extraordinary, true stories that we have found, ..... those include the industrialists’ trials in Nuremberg, a secret plot by the British government to limit the number of Jews emigrating to Israel, and a scandal within Churchill’s secret army. It’s strange that we would never have been able to tell these stories to a mass audience if we were not seen and promoted as a “murder mystery” show. Certainly, I’ve lost count of the number of dead bodies and red herrings that have mounted up over the years. But the greatest pleasure, for me, has been not the crimes but the way we have been able to explore this extraordinary period in British history. These are stories that deserve to be told and I’m proud that we have told so many of them – often for the first time – in Foyle’s War."